Disney saw growth in both revenues as well as margins for its media networks business. This business is dominated by ESPN, the Disney Channel and ABC Broadcasting. While broadcasting remained more or less flat, cable networks saw good growth in revenues and operating income. This was driven by an improved advertising market and contractual increases in fees per subscriber. 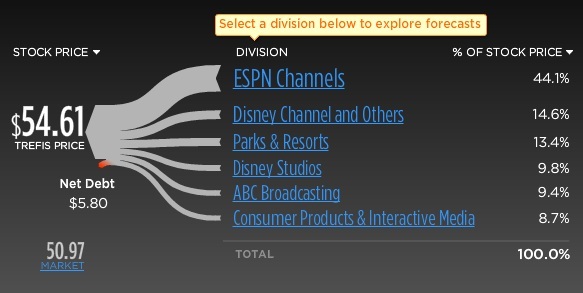 We estimate that ESPN will bring close to $11 billion in revenues for Disney in 2012. These include revenues from primary ESPN channel as well as its other sister channels such as ESPN2, ESPNU, ESPNEWS, ESPN Classic and ESPN Deportes. A large chunk of these revenues, approximately $10.3 billion, will come from ESPN and ESPN2 alone. If we dig deeper, we find that close to $9.1 billion will come from just ESPN, with ESPN2 contributing approximately $1.2 billion in 2012. The channel has close to 100 million subscribers in the U.S., which speaks of the huge demand as well as bundling strategies that pay-TV service providers adopt. 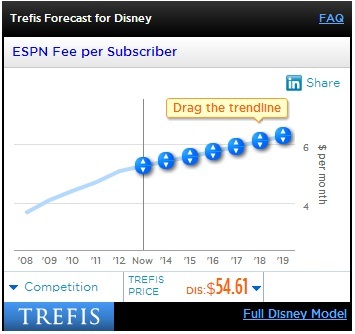 Additionally, ESPN charges more than $5 per month per subscriber, by far the highest carriage fee in the pay-TV industry, with the exception of a few premium cable networks such as HBO. In addition to over $6 billion generated through subscription fees, ESPN generates close to $3 billion in ad revenues. ESPN enjoys an average daily viewership of over 1 million and charges high ad prices from its advertisers. We estimate this pricing to be around $16-$17 per 1,000 impressions. This accounts to a huge amount, but its advertisers are big companies with high spending capacity that target male audiences (typical audience for sports channels). Besides ESPN, the Disney Channel is another flagship channel for Disney. In 2012, it surpassed Viacom’s (VIA) Nickelodeon to become the top-rated channel on cable. As expected, the performance paid off, and Disney stated that the channel was the prime driver of cable networks revenue growth in Q3 fiscal 2012, due to a contractual increase in subscription fees. Nevertheless when seen in context of the whole company and compared to ESPN, the Disney Channel is still a small value contributor.